The Maryland Legislature recently passed a bill that will lower the maximum penalty for possession of marijuana from 1 year in jail to 90 days in jail. Maximum fines for marijuana possession will also drop from $1000 to $500. 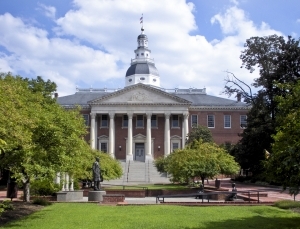 The bill was signed into law by Governor O’Malley and will go into effect in October of 2012. The Maryland marijuana bill only applies to simple possession of less than 10 grams of the plant, a compromise between the two legislative chambers. The Maryland Senate wanted the new bill to apply to possession of any amount less than 14 grams of marijuana, or one half ounce, but the Maryland House wanted reduced punishments only for less than 7 grams, or one quarter ounce of marijuana. The Maryland law makers eventually agreed on the 10 gram limit, and the bill easily passed both chambers by a vote of 41-5 in the Senate, and 92-31 in the House. Maryland law makers have recently been focused on streamlining the judicial system, and the marijuana bill appears to be a small step in that direction. According to the FBI, Maryland police officers made nearly 24,000 marijuana arrests in 2010. Many of the resulting criminal marijuana cases can linger for months in Maryland circuit courts, because defendants who face more than 90 days in jail are entitled to a circuit court jury trial. Only a fraction of these circuit court cases are actually tried in front of a jury. Criminal defense lawyers, and the defendants themselves are aware that these cases often end up being dismissed or reduced after months of stagnation in circuit court. The theory that good things happen to those that wait out their criminal cases is often true for defendants, but the judicial system ends up bearing the burden, and has become increasingly and unnecessarily bogged down. The new Maryland marijuana bill will serve to remove all possession of marijuana cases less than 10 grams from circuit court jurisdiction because the defendant will no longer be entitled to trial by jury. These criminal cases will be filed in Maryland district court, and unless the lawyers can work out an alternative plan, the defendant will have to choose between a guilty or no contest plea and a bench trial in front of a district judge. The lifespan of a case in district court is generally much shorter than a case in circuit court, and district court cases require less government resources. The marijuana bill received approval from criminal defense lawyers and even Maryland prosecutors. Baltimore State’s Attorney Gregg Bernstein went on record in support of the bill’s likely effect of lowering the case counts in Maryland circuit courts. The Baltimore State’s Attorney also stated that the bill should allow prosecuting lawyers to focus more time and effort on preparing violent criminal cases for trial in circuit court. Opponents of the bill contend that it sends a negative message to the public that Maryland is becoming more accepting of marijuana and other drugs. This argument though is purely hypothetical and out of touch with the realities of the judicial system. There is simply no reason that possession of less than 10 grams of marijuana should have a maximum penalty of one year in jail. You could probably count the number of defendants that have ever been sentenced to 1 year in jail for less than 10 grams of marijuana on one hand. The current maximum penalty is obsolete and the Maryland legislature is taking a step in the right direction with the new marijuana bill. Benjamin Herbst is a Maryland criminal lawyer, specializing in defending marijuana possession and other drug possession crimes. The Herbst Firm’s Maryland marijuana lawyers, are available 24 hours a day, 7 days a week for a free consultation. Penalties will drop for pot possession in Maryland, washingtontimes.com, May 1, 2012.